For those that have read the Rock & Roll Trilogy, this book is a must read, and for those that haven’t, this is a series you need to read stat! Those that love emotional, poignant, romantic reads, Barbara S Stewart never fails to deliver and Rock & Roll Never Forgets is the epitome of that kind of read. Rock & Roll Never Forgets literally decimated me emotionally and while that book is told from Bethy’s point of view, with Timeless we get Andy’s point of view of the past in a trip down memory lane. I loved the premise as to how this book came about and though this trip was a deeply emotional one I personally felt it was a trip that Andy needed to make. Timeless is a book of reflection, an analysis of the past, the highs, the lows, mistakes made and wars won. To truly move on you need to forgive yourself and while for Andy this was something he never made peace with, in Timeless, he becomes the man he needs to be, rather than the one that everyone else expects him to be. 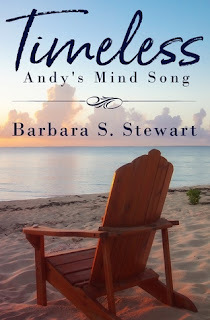 Bethy and Andy had the kind of love that everyone wanted, these two adored each other, loved each other completely, but sometimes too much, is just that…too much. Their love story was one that had me in tears many, many times, when it was good, is was really, really good, but when it was bad…it was horrid. In Timeless, we are privy to Andy’s most intimate thoughts and feelings as some of the most pivotal events in his and Bethy’s life are once again brought to the forefront. Barbara Stewart brought back all those initial thoughts and feelings as once again my emotions traversed Barbara Stewarts words. Reading this book has made me want to read Rock & Roll Never Forgets again, I just need to make sure I have enough tissues to hand. Andy is far from perfect, he knows his flaws, he embraces his mistakes and while Bethy’s mantra of “shoulda, coulda, woulda” is very prominent throughout this book, this is Andy coming to terms with how he currently finds himself in a state of limbo and what he needs to do to make himself feel whole again. Being inside Andy’s head, being privy to his most innermost thoughts and experiencing that raw emotion all over again, certainly had me choked but I loved finally knowing the other side of the story. This is the grand finale, the final show, the encore and everything else in between. Everything is wrapped up; favourite characters are present and leave their mark. Pasts are navigated, futures are made and emotions are definitely touched. This was a poignant read, one I never knew I needed and now having read it, one I most definitely wanted. Once again, Barbara Stewart has moved me with her words and now I am going to go back to the beginning.